A full service shopping cart development company, Zaptech Solutions provides complete shopping cart software solutions matching clients’ specific business requirements. We give the right shape to your business by delivering exceptional eCommerce web shops. Online shopping cart helps you get a virtual store front to reach millions of customers. If you want to sell your products or services to the online world, shopping cart software can be the right choice. The main aim of every shopping cart eCommerce website design is to attract the customers and generate the maximum ROI. Your business needs an innovative and user-friendly shopping cart solution to help you achieve your business goals. eCommerce business starts with customers and ends with customers. So, it is important to build an attractive website to make profits. We have huge expertise in exceptional shopping cart solutions helping clients maximize their sales. We have a dedicated team of experienced web designers, developers and programmers who build appealing shopping cart websites for the clients. Our software development company offers custom web solutions that are cost-effective and high performing. They help the clients get the maximum ROI. Clients get out of the box shopping cart solutions matching the latest industry trends. Security plays a major role in the success of any eCommerce website. We think of the most secure shopping cart solutions and build your website keeping in mind the targeted audience. We gather the best talents in the industry to make sure that our clients get the best solutions to help their business grow. The market is full of different types of shopping cart solutions. We understand your business needs and suggest the most constructive solution. We leverage open source web development platforms such as Magento, ZenCart, XCart, Volusion, VirtueMart, Prestashop, WooCommerce, Opencart, and many more. Our main aim is to help the clients reap the maximum benefits of an online store. As a web designing company, Zaptech Solutions offers custom eCommerce development services to help your online business reach new heights. Contact us now to know more about us or our solutions and services. We offer end-to-end shopping cart solutions that give an edge to your online business. Numerous user-friendly features make Magento eCommerce development platform a preferred choice of many developers and users across the globe. Our Magento experts leave no stone unturned for improving the user experience of your eCommerce website. Zaptech Solutions, a leading custom Magento development company, offers latest and futuristic software technologies to ensure that clients get flexible, robust, and scalable development solutions. Zaptech Solutions provides secure and scalable PrestaShop development solutions. Our proficient shopping cart developers follow the industry best practices to design, develop, test, and deploy processes. The programmers focus on developing additional modules or plugins to make your eCommerce website efficient and effective. We as a PrestaShop development company, aim at promoting your growth and expansion of your eCommerce business. Do you want a new Volusion development solution? We have a huge expertise in developing Volusion stores from the scratch. We take the clients beyond the templates and deliver Volusion customization services to the clients. We can also customize the templates as per the clients’ requirements. Combing beauty with technology, we make your Volusion eCommerce website stand out of the competition. VirtueMart is a popular open source eCommerce platform that is used for building online stores and shopping portals. Being a Joomla based eCommerce solution, it takes the maximum advantages of Joomla development exclusive features such as user registration, templates, backend administration, SEO friendly URLs and support. 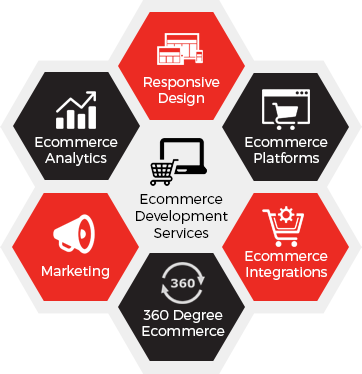 Being a VirtueMart development company, we offer Custom eCommerce website solutions to the clients globally. If you are looking for a secure and easy to manage eCommerce store, Shopify can be the right platform. The expert Shopify development team working with us maintain complete transparency with the clients and send regular development work progress reports. We help businesses get amazing online stores using Shopify eCommerce development platform. Zaptech Solutions provides engaging and intuitive WooCommerce development services. We build powerful and extendable designs, plugins, and themes to boost your online presence. We offer custom eCommerce solutions that helps your business stand out of the competition. We know how to assist clients increase their sales and business revenue. Our company offers custom web design services according to the clients’ requirements. We have huge expertise in payment gateway integration for eCommerce stores. They can integrate PayPal, Authorize.net, and others. We build responsive eCommerce websites that work well on all the major devices. They deliver user friendly websites. Our expert dedicated developers excel at customizing and developing plugins and modules to add the desired functionality to your store. We can integrate on-site POS software to make the payments easier via your merchant account. Our company offers exceptional support and maintenance services to ensure that your website runs well all the year round. Want to build your eCommerce website?